This is an exploration game where you collect artifacts in a strange place. It has multiple endings, with a little bonus if you find them all. It’s at least partly an exercise in storytelling after the fact: storytelling by use of clues, letters, and remnants rather than events. It’s also an homage to the gorgeous use of 1-bit color games for the early Macintosh and other black-and-white systems… although I cheat. Fun. I seem to have all endings save the last, but my log of mysteries is empty so I’m not sure what else to do. The interface is lovely and consistent for all things I’ve tried save the lampposts. It was confusing that I couldn’t press X whenever I saw it, but only when standing in front of them; it was also confusing that I had to hold X, even though elsewhere in the game X is always pressed, not held. The final ending is the most difficult, and requires a bit of thoroughness; there are no real clues as to where to get started. I’ll say this: find some places that are significant, but far away from anything else. Chances are you’ve never been to these places, but they are easy to find once you think to go to them. By the power of that hint I got it, but I don’t think it’s fair. There should be some clue beyond an unfilled circle that that’s something I’d want to do. It’s contrary to the logic of the game, which elsewhere does a lovely job of leading me places. And I’d still like the interface for the lampposts improved. The final ending is a bit of a reward for thoroughness, as well as an encouragement for people who get so frustrated that they begin a systematic traversal. I had hope that those who followed the signpost scavenger hunt would also run across a clue for the final ending. How would you suggest the lamppost interface be improved? The first thing I’d change about the lampposts is to have them react to X whenever X is displayed over them. I was only able to get them to react when standing directly in front, even though X is displayed from all sides. The second thing I’d change about the lampposts is to have them transition between steps of, oh, one-sixteenth of a circle. When a player press the button, even if they don’t hold it, they should see what the button does there. You could have the lampposts move between the steps as smoothly as they currently move. I’ve been playing for over an hour, and though I’ll return to Looming another day I think I’ve hit a wall for now. I have eight of the endings and I think I’ve done everything I can in the world; the only thing I can’t make sense of is the meaning of the shattered diagram. I’m having a little trouble with the shattered diagram too. There are some objects with so far have had no significance, but I’m not sure how/whether these correspond with the shapes on the diagram. I’ve found a few places that are out of the way and stand out but I still can’t figure out how to get the final ending. I’ve got all the other ones and it’s really frustrating. D: I’ve managed to get all the endings for your other games but this one just isn’t clicking. I’ve managed to find the four hidden posts for the last challenge (at least I think it’s for the last challenge, but I can’t make heads or tails of the “stars”…. Such a great game. I couldn’t quit until I found all the endings. Got all the medals. The difficulty factor was great, there wasn’t a single moment when I thought of searching for a walkthrough. Wonderful atmosphere, interesting story. Interesting cultures of the Lorem and the Seecha. They heavily maginfy the properties of our cultures. And after seeing ourseleves through that magnifying glass we can give a thought about what we are. Whilst I adore the the way you’ve crafted so much atmosphere into such a bleak environment I didn’t appreciate the pacing. After seeing a couple of endings in the first <5 minutes of play, I then had to spend another 35 minutes ambling around aimlessly looking for increasingly hard to find items that never seemed to resolve into complete sets, before anything different happened.. By the end of that (and of my lunch-break) my patience was entirely spent, and whilst I'd love to see the other endings I don't imagine I'll be coming back to this. I played your game today. I liked the graphical juiciness of it. It reminded me a bit of Manhole on the macintosh, which is great, because games with a strong surreal quality to them are hard to come by these days. I kind of want to go back to Looming… in the vain hope that I’ll find something else to remember. Manhole isn’t hard to come by, though! Good Old Games carries it. Keep up the good work Gregory! Could you be more specific and give some hints? Have collected all the items and found most of the portals. Still miss n°2, 8 and 9. I don’t know what to do anymore! Found a lot of hidden spots but nothing very helpful! More clear hints: Number 2 is at the end of the path that threads through Looming. EDIT: Number 2 actually requires you to enter the same portal as number 1, but to have spent at least a minute in Looming. Number 8 requires that you find all of a series of hidden signposts; the start of this path is a visible signpost just off of the path I just mentioned. Number 9 requires that you find some hidden clues as far away from everything else as possible; if you’ve gotten ending number 7, you’ll know what to do with these clues. Oh I found another one (with the star clue)! Now I can focus on number 2 and 9. Thank you Gregory, i’m working on it! If I can suggest something : maybe the portals could be numbered so we can easily remember which is which? Thanks for the tips even if I haven’t figured it out yet! Okay I’m still missing number two!! Followed the path as you suggest but the portal I’m leading to is not the good one: after I took this one, I begin the game with a still black n°2. My apologies; I had the wrong number. 2 uses the same portal as 1, but occurs when you’ve been in Looming for a while. Spend a minute or two in Looming, then enter the portal near the beginning. Well done Gregory, this game is a work of art. Hurrah! Thanks to you I just finished it! It was a very pleasant game (despite some trouble with orientation at first) and i found the note section at the end very interesting! For your next game, may I suggest to add a map (which can be discover as any other item) and maybe something to help the little guy to run faster (when you have to cross the entire screen it’s a little bit long)! Thank you anyway, it was great! Gotten all of them but number 2 after reading the spoiler for number 9. (I had found one of the clues, but was in the middle of something and forgot about it.) If number 2 is at the end of the path, does it end with “my feet are tired”? If so, I think the circle might be bugged. My apologies; number 2 is not at the end of the path. It is the same portal as number 1, but requires you to spend at least a minute in Looming. Bead IV is near Seecha Rod IV, at the Oarbor trap to the southwest of the lampposts. I just finished Looming and thought it was great. I don’t have any criticisms, necessarily, just a couple things that were a little maddening/frustrating about it, which may have been intentional on your part: The prominent but ultimately inconsequential architecture scattered throughout. These, coupled with the diagram, made me think they were the key to getting the 7th ending, as some were in roughly the 4 corners of Looming. I had to get a hint to realize what I should be doing with the diagram. I hadn’t thought of it because I used that method to get the 9th ending, and didn’t think it would be used again (trying to use vague terms to avoid spoilers here). Anyway, all in all, it was a great game. Please continue making games knowing that they’re thoroughly enjoyed. I have to admit that comleting the whole game is very difficult despite the simple gameplay. reaaly fascinating, anyway. I’m stuck at 9th ending: I just can’t realize what to do after finding the four hidden signposts. I desperately need a clue. If you’ve gotten all the other endings, you already know how to get the ninth. You can use the clues you’ve gathered and a method from one of the other endings to get the ninth ending. Wow, it seemed so simple once I’ve solved it. By the way, I like the names of the “lithocryptologist” and the “xenopaleontologist” medals. They’re a combination of ancient greek words. I can’t figure out number 8. I’ve gotten all of the other ones. How many sign posts are there? And would the portal be hidden in some way even if I have found all of the signposts? Aaaaaaaaaaaagh. Got everything except Tally Beat II. Clues? please help! I have found all but 1 bone. Great game. Kept me playing until the end. Maybe I’m just really good at this sort of thing, but the only one that I got hung up on was the last one. I loved the notes at the end tho. Great idea that. If you have enough patience, you can simply scour the whole Looming by simply going to a corner, reach the opposite wall, going down a little and do the same. It’s like to seed a field. where are all the bones? Head east from the starting area until you find a pillar with a hidden signpost south of it. The bone is just slightly to the east of that pillar, it should be visible to you when standing next to the pillar. ahhhhh i’ve got it now. god it always seems so obvious once you get it. I’ve got everything but 9. I read that if I did ending 7 I would know what to do but I am still very lost. Please help? Very good game! At first I was confused, but I got a lot of the things and it started coming together. The story is very interesting. I love how to two different people people came into Looming, and did completely different things. I would love to complete it, but I am stuck trying to find the fourth bone. I even figured out the ninth ending. AH! I figured it out! I thought and thought and thought and finally came up with the proper solution. Thanks for the useful hints and great game. Any help getting the last two secret ones would be secret ones would be greatly appreciated. Amazing. Just flat out amazing. It’s very simple yet kind of heartwrenching at the same time. It was an emotional journey through a one-bit (ish) lens. Hey Greg, great job on the game. My only gripe is that having to use the same method to get two endings really threw me off. I found ending 9 before ending 7, which led me to assume that the diagrams couldn’t possibly reference the same objects. I feel as though the game would have been better had one of those two endings been omitted. I’m sure you had a good reason for including both of them, but I felt that it made the game unnecessarily frustrating. With that said, it was still an incredible game. Keep up the good work. Did you ever consider making this game in 3D? Given the description of your initial inspiration, and how you wrapped up your 2D vs 3D post in May (“3D games are about place, about architecture”) it seems like 3D would have been a natural aesthetic fit. I didn’t actually consider making this game in 3D. The quasi-isometric scaling and the very high camera really work best in 3D, and the 1-bit dithered graphics would have been a nightmare to figure out for someone with my limited knowledge in shaders. 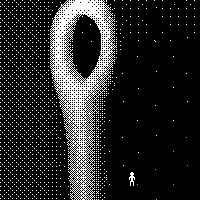 Well sure, I don’t think you could have done the 1-bit aesthetic easily in 3D, I just meant the high-level aesthetic goals mentioned as the starting inspiration (giant looming architecture). Just look at the fan art you just posted, which (naturally, I’d say) switches perspectives to try to achieve that effect more directly. Anyway, I didn’t actually mean this question as a criticism of the game as is, just a curiosness over the choice given the goal. I didn’t read your comment as criticism. The 2D perspective just seemed the natural choice for this game. Quite beautiful. Completed it with no hints; some stuff seemed misleading or confusing, perhaps, but mostly everything was okay. Main trouble I had was with the second to last hidden signpost: I couldn’t find it with the aid of the tip I’m given by the previous one, and instead I thought it referred to the last one, so for a while I thought I’d found them all, yet there was no portal. I ended up finding it by chance, though. I was quite anticipating that reveal. I expected more climactic moments once ‘secrets’ are ‘revealed’, but actually this is better. We’re not Indiana Jones. Was the name and font used intentionally referencing Loom, or was it just a coincidence? I enjoyed it a lot, but sort of wished that some of the long walks were punctuated with more points of interest – for example, the birds were cool, and I guess more stuff like that and the odd bit of unique non-functional scenery would keep me entertained. Loom was certainly in my thoughts while making the game, but the name arose independently, and the font was chosen according to what I preferred for the game. Hey Greg, Looming is today’s “Morning Distraction” on thedailywh.at! Ah just checked it and actually they used a fully upper-case font: I certainly wasn’t accusing you of plagiarism – I hope you don’t think that – just that it may have been a (possibly subconscious) homage. Anyway, great work and I’ll definitely get round to finishing it over my next few lunch breaks. Excellent game, and I agree that it’s your most polished to date. I’m afraid I resorted to hints, as I was/am very tired, needed to get up early, and couldn’t just walk away from it (nor without some accolades here). Great story though. The PC has a dutiful passion for exploring that felt very much like the PC in Myst. The setting is fantastic, and I’m struck by how well the 1-bit setup worked. The instructions and clues are very well p[l]aced, save for the blasted first hidden sign post (spotted by accident early on before I realized I ought to pay attention to those – at the time I was chasing the moving shadow, hoping for a colossus or some flying monster). Also, the white “X” on the light houses threw me off; I suppose making them flash red and green with yellow arrows would have been slightly out of place, though. The only real stylistic gripe I have is that I kept thinking of Loom, how it wasn’t at all like Loom, and then about the blasted and unhelpful pirate wearing the button “Ask me about LOOM” (I thought of him a few times when I got lost on the final first hidden pillar). I have found all the endings but 7 I just cant seem to find it, Anyone have a hint for me? Can’t get ending nine. You say that I shall do like in ending 7 but can’t rember that. I very much enjoyed the game. It seemed much more of a story to me, and I understand why some people might be confused or not like it, but I certainly did. I think my game’s bugged– I have found every single ending, but I still can’t find the last Seecha rod. I looked for it for hours upon hours, resorting to combing the entire landscape to cover as much ground as I could. However, I still can’t find it. Could someone give me a hint? I like exploration a whole lot, so I’ve been enjoying this. Also struck me as a bit Lovecraftian, was that intentional? Are you holding down the button? Are you standing directly south of the lamppost?